FREDERICTION - Motorists in New Brunswick will see 10 new fast-charging stations installed this year along the Trans-Canada Highway as the result of a partnership between the federal government and NB Power. Fisheries and Oceans Minister Dominic LeBlanc announced $335,000 to build the new station and said it was to help address "range anxiety." "Some Canadians are hesitant to buy these cleaner vehicles because they fear that the infrastructure is not there to support their choice to drive an electric vehicle," he said. "It's a fair point in a province where there's a high percentage of rural residents." In partnering with NB Power and utilities elsewhere in Canada to build the proper infrastructure, the government hopes to instill in people — including would-be electric-vehicle owners in New Brunswick — the confidence that they can get from Point A to Point B driving one of these vehicles. 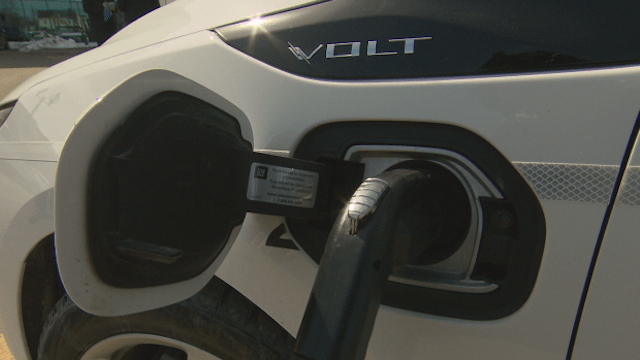 NB Power estimates there about about 100 electric vehicles in use in the province. The federal government announced $120 million in similar infrastructure projects across Canada on Tuesday. In addition to financing electric vehicle (EV) charging stations, the government will use the balance of the $120 million to help fund refuelling stations for alternative fuel vehicles and, it said in a release, "support technology demonstration projects." As LeBlanc noted Tuesday, the transportation sector generates almost 25 per cent of Canada's total greenhouse gas emissions. More specifically, cars and trucks and commercial vehicles produce about three-quarters of the sector's emissions. Electric and alternative fuel vehicles — those that run on natural gas or hydrogen, for example — can considerably reduce these emissions. NB Power's Keith Cronkhite, senior vice-president of business development and strategic planning, said the new fast-charging corridor will become part of the utility's existing charging network for electric vehicles. "We are confident it will help New Brunswickers make the switch from gas to electric vehicles and reduce that range anxiety," Cronkhite said. "Encouraging more New Brunswickers to drive EVs [electric vehicles] is an essential part of our plan to support the climate change action," Cronkhite said. "In New Brunswick, an electric vehicle owner can shrink their carbon footprint by approximately 80 per cent thanks to our renewable and non-emitting grid." Currently, there are nine NB Power-branded charging stations across the province. Unlike those announced Tuesday, those are Level 2 chargers — or those for use by hybrid vehicles. By comparison, the fast-charging (or Level 3) stations NB Power will install this year typically service entirely electric vehicles. Using those chargers, drivers will be able to recharge their EVs to approximately 80 per cent within 30 minutes. NB Power hasn't decided where it will install the stations along the Trans-Canada or what it will charge drivers to use them, but is aiming to have all 10 in operation in July. The utility will install Level 2 chargers beside each of the 10 new fast-charging stations "so that we can meet the needs of all New Brunswickers," Cronkhite said. Altogether, there are some 50 charging stations in New Brunswick.